Releasing the first fall drop. Season 02—the fourth overall Stillers™ collection—celebrates a number of foundations in Stillers tradition. Embroidered left chest designs first executed in the inaugural collection, Post Season 01, are updated with a new colorway and slogan, “Bend Don’t Break,” a mantra uttered by Stillers icons like Mike Tomlin and Terry Bradshaw, and embodied by a resilient city. The khaki long sleeve is reminiscent of the team caps former head coach Bill Cowher sported in the early 2000s. It also represents InTheRough’s first foray into graphic print, as the back of the garment features an idyllic rendering of Three Rivers Stadium before it was home to The Steel Curtain, The Terrible Towel, and four Super Bowl championships. Season 02 was conceptualized and designed by InTheRough staff including Maxwell Young, Alex Young, Quaishawn Whitlock, Alex Hersh, and Justin Berk. Manufacturing was executed by Touch of Grey Tees & Public Print House. Shop Season 02 through the Stillers tab located above this article or at Senseless on Penn Avenue. Stay tuned for drop two. The Stillers had just triumphed over the Kansas City Chiefs in a knock-down-drag-out of a 2016 Divisional Playoff game when Antonio Brown--not even showered and changed--let the world catch a glimpse of the rituals and gaiety that are only confided in a team's inner sanctum. Boasting numbers of 44k ("Woo! That's a lot of K's," shouted offensive lineman Alejandro Villanueva in the video), the Stillers locker room was broadcast via Facebook Live starring the likes of Le'Veon Bell and a particularly enthusiastic ex-Stiller, Sammie Coates. By now, Stillers Nation is accustomed to the pop star lifestyle of AB. If you're not, this piece by The Undefeated on Brown's social media usage should paint the proper picture. Then there's the hip hop bars of Juice, the "Rappin' Athlete," and even the millennial virility of newcomer Juju Smith-Schuster. Watching some of these personalities unfold during the sacred moments of that post-game was not only a demarcation in sports history but also symbolic of this generation's Pittsburgh Stillers, whose personas transcend their play on the field. Some might argue that's not a particularly good thing. Le'Veon Bell, still looking to be "fairly" compensated for his value to the franchise, has surprised teammates by not reporting to the team's facilities in preparation for their season opener against the Browns. This is a deviation from last year when Bell refrained from training camp activities only to return locked-and-loaded for a full regular season. Football was football and when it was time to strap up, Bell was in the huddle with his brothers. Through the second year of a contract stalemate, it appears as though Bell is only concerned about himself. And although number 26 is established as a premier player in the NFL with millions of followers to reinforce this popularity, his five seasons with fellow Killer B's Big Ben and Antonio Brown have been championship-less. That's not Stillers football, and that’s not the track record Stillers Nation expects from one of the deadliest offensive trios to ever grace the gridiron. This team is flashy with their splash plays, creative celebrations, and bespoke Gucci suits--everything is finesse. They are not the Steel Curtain anymore, no, welcome to the Social Media Curtain where image is everything. Personal social media accounts of Stillers players only scratch the surface of the worldwide exposure Stillers Nation has. A quick search for "Steelers" on social platforms pulls a number of fan, news, apparel, and parody pages that provide additional commentary throughout the NFL season. Below are a select few of these accounts as well as a conversation with John Irvin, founder of Stiller Gang, the fan base responsible for extreme tailgates, unique merchandise, and a worldwide cohort. The quintessential Yinzer--Pittsburgh Dad reinterprets what fandom of the Stillers really looks like in his weekly reaction videos on YouTube, Facebook, and Instagram. His enunciation of Pittsburghese and aptitude of football culture make his skits like "At The Steelers Game" quite authentic. Pittsburgh businesses have caught onto the popularity of Pittsburgh Dad as well, and now he's starring in local commercials. Mike Tomlin is a man of few, yet impactful words. Though he is often emotive with his body language, his press conferences are filled with distinctive one-liners such as, "We're not Powerball excited, but we're excited," "The standard is the standard," and "Everybody with a helmet on is in the mix." With over 100,000 followers on Twitter, Evil Mike Tomlin is the alter ego of the twelfth year head coach--fully transparent with no tact. For over 50 years, Stillers Nation has taken the journey up to Saint Vincent's College in Latrobe, Pa. for the free spectacle that is NFL training camp. Of course, there are die-hard fans who travel thousands of miles to see the makings of the latest Stillers squad, but some of us don't have that freedom. Fortunately, City of 6 was on the campgrounds from start to finish, filming one-on-one drills and full-padded competition. Every day he'd upload multiple clips to Instagram of Stillers draft picks acclimating to the system or Antonio Brown demonstrating that he's already in mid-season form. Coverage was so comprehensive that SportsCenter used one of his highlights of Brown in their Top 10 Plays segment. ITR: Some people become Stillers fans by birth, others are Stillers fans because they’re from Pittsburgh...some base their support on merit, while others are fans by association. We accept band-wagoners and roll our eyes at the fair weather-ers. What’s the story behind your Stillers fandom? JI: I was born in Pittsburgh, where the Steelers are a part of the culture. It's taken for granted here that the average citizen is a fan. You have the occasional jag off that just wants to go against the grain, but for the most part we all support the home team. ITR: What was the impetus behind Stiller Gang (and when was it founded)? How were you able to spread this identity across the globe? JI: I attended my first game ever (thank you for the ticket, Bobbi) Dec. 4, 2011 and was blown away by the camaraderie amongst fans from all over the world and all walks of life. People who normally wouldn't interact with each other based on demographic differences embraced each other like family, bonded by a common love for them Stillers. On that day the first "Bang Bang Stiller Gang" was uttered (we beat the Bungles 35-7) and an idea was formed to gather fans under a common banner. The following summer of 2012, the movement began. Spreading across the globe has been made possible in part by social media, and in part by people in key places pushing the movement. The West Coast (California has the most Steelers fans outside of PGH in the US) has shown a tremendous amount of support, and it couldn't have been done without Martin Villareal pushing out West. Mexico, Germany, The UK, etc.. all places with people going all out for the movement and creating the momentum that spreads it further. ITR: What do you make of Le’Veon Bell’s contract situation? The recent disparaging comments by his offensive line suggest a rift between the all-pro back and his army. How does his absence affect our season? JI: I understand Bell's perspective. He wants guaranteed $ just in case he gets hurt and his career is cut short. He produces as a running back and a wide receiver and feels he should be paid accordingly. The front office feels like they don't want to pay and gamble on him remaining healthy. I wish this situation had been taken care of because I would love to see him on the field. However, if he isn't, the next man up will handle the job. James Conner has been working hard in the offseason and will be up on Sunday. The apparent rift is unfortunate and I hope these guys can work it out like family and come to a better understanding. How this affects the season depends on Conner's play and the play of the team as a whole. ITR: What cities are you looking forward to traveling to the most this season? JI: All of the away games outside of the AFC North are going to be crazy this season. Florida is FULL of Stillers fans, so Tampa Bay and Jacksonville will both be packed. Jacksonville is a grudge match and we want revenge for last season. New Orleans is a game I'm looking forward to just because of the location. We look forward to seeing our fellow fans from that part of the South. Texas will definitely be present that weekend. Same with Denver. Oakland is a game I'm looking forward to not only because we will be with our West Coast chapters, but because of the historical significance. It will be the last time we play the Raiders in the city where the Immaculate Reception happened. ITR: Which Stiller Gang cohort goes the hardest? JI: Man for man, pound for pound, the German Chapter of Stiller Gang EU goes the hardest. Big air mileage. They flew in from Heidelberg for four games last season and will attend at least 4 this season. ITR: Describe the difference between the 1970s Steel Curtain, the early 2000s Stillers, and the 2010s Social Media Curtain Stillers. JI: I feel that one of the biggest differences between the eras is the speed of the game and how it's changed the offensive attack. All 3 eras played above the bar for their respective periods. ITR: What’s our record this year? JI: 13-3, then we win the Super Bowl... Bang Bang Stiller Gang! This Nike ad will give you chills. Not for the star power that is tennis champion Serena Williams or the promotion of a new Nike product, like the Off-White x Serena "Queen" collection, but for the jolt of confidence the commercial gives each viewer. In her newest Nike spot, Serena Williams is seen as a child being trained by her first tennis coach and father Richard Williams. "This is you at the U.S. Open. 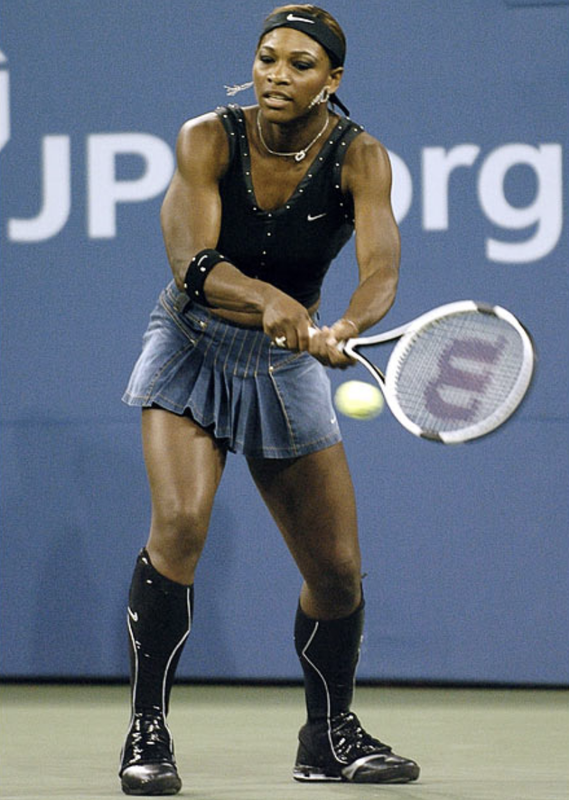 This is you," Richard Williams says as she practices her serve. The screen cuts to Serena as a pro, a proven champion and her father's voiceover directs her movement on the tennis court. "Switch to the backhand... Take the net!... Be tough just like you want to win. Just like you at the U.S. Open," he says while Serena crushes opponents throughout her career. Black screen to copy. "It's only a crazy dream until you do it. Just do it." It's up to you to turn your dreams to reality. DeAndre Kane (left) and D.J. Kennedy (right) who won the Pennsylvania state basketball title in 2007 have won The Basketball Tournament four times. In the world of basketball, The Basketball Tournament, which carries a multi-million dollar prize, "is just like a hobby or something extra for guys,” D.J. Kennedy said in a Deadspin about the tournament his team Overseas Elite has won four years in a row. There's something legendary about the tournament though. It's the fact that two kids from Pittsburgh's Hill District ran a train through great competition filled with former NBA veterans and collegiate superstars every year to accumulate a 25 win and zero loss record along with $7 million in prize money. DeAndre Kane and D.J. Kennedy have a reputation in the 'Burgh for playing championship ball. In 2007, their Schenley Spartans team won the quad-A State title with help from University of Pittsburgh standout and former San Antonio Spur DeJuan Blair. At Marshall University and Iowa State University, Kane earned weekly and yearly awards consistently until he graduated. He was the Big 12 conference tournament MVP in 2014, and then he went on to bounce the North Carolina Tar Heels out of that year's March Madness NCAA Tournament with a clutch drive to the hoop beating the buzzer. Kane's Maccabi Tel Aviv team won the competitive Israeli Basketball Premier League this year. For Kennedy, his defensive and scoring consistency at St. John's University carried him into the NBA briefly. More impressively, Kennedy's been the top scorer of two separate European basketball leagues in 2015 and 2018. He's been The Basketball Tournament MVP in the same years too. Kane and Kennedy's prestige may not be mainstream like that of an NBA superstar's, but their legend is battle-tested as they repeatedly rise to the occasion. This Saturday, August 18, 2018, appreciate the men's achievements, especially as they celebrate more T.B.T. rings (4 for Kennedy and 3 for Kane), and come out to their 3-on-3 basketball tournament and community event giving away backpacks and school supplies at Ammons Recreation Center in Pittsburgh's Hill District from 4 p.m. to 8 p.m. Turn up with the fellas that night at V Lounge. Last Thursday, Pittsburgh lost a native son. Dan Rooney, former chairman of the Pittsburgh Steelers and United States Ambassador to Ireland, passed away at the age of 84. Mr. Rooney was born in 1932, one year before his father, Art "The Chief" Rooney founded the Pittsburgh Pirates Football Club--or the first iteration of the Steelers. At five years old, he was already involved with the franchise working as a water boy, and he later met his wife, Patricia, in the office of the Steelers where she was working. Much of the successes of the Steelers and that of the National Football League are due to Mr. Rooney's contributions. It was Mr. Rooney, the general manager, who selected Chuck Noll to lead the team from mediocrity in 1969 to a record four Super Bowl victories during the Steel Curtain Dynasty. It was Mr. Rooney, the former accounting major from Duquesne University, who crafted the modern unrestricted free agent system in 1992 that resulted in higher player salaries. And it was Mr. Rooney, the owner, who urged the NFL to create more opportunities for minorities to earn high-level coaching and administrative positions in what ultimately became known as the 'Rooney Rule'. Mr. Rooney had a lifelong commitment to advancing the relationship between the American and Irish people. In 1976, he and former CEO of the H.J. Heinz Corporation, Anthony O'Reilly, founded the Ireland Fund, which promotes peace, culture, and charity. The nongovernmental organization has increased its world exposure, sprouting chapters in 12 other countries and has raised over $550 million since its inception. Mr. Rooney's nationalist relations with Ireland also made him an apt choice to serve as the US Ambassador to the country under President Barack Obama. From July 1st, 2009 to December 14th, 2012, Ambassador Rooney served his appointment, and to date, he is the only ambassador to have visited all 32 counties in Ireland. Despite his world adventures and despite the level of prominence he elevated the Steelers franchise, Mr. Rooney always considered the North Side of Pittsburgh to be his home. He was an accessible man, walking to Pirates games and frequenting local spots in the neighborhood, like Gus & Yia Yia's storied icy ball stand or Legends, an Italian-style eatery next to Allegheny General Hospital. Tailgaters could mingle with the owner on game days as he traveled the five minutes down North Shore Drive from his house to Heinz Field in a black golf cart. Dan Rooney is survived by his wife, Patricia, and their seven children. The eldest of them is Art Rooney II, the current owner of the Pittsburgh Steelers. His memory lives on in the hearts and minds of Steelers past and present as well as inside the people of Pittsburgh. Following his death, Obama recounted his friendship with Mr. Rooney saying, "he was a model citizen and someone who represented the United States with dignity and grace on the world stage...a championship-caliber good man." A public viewing is being held for Dan Rooney later this afternoon at Heinz Field from 2pm to 7pm at the PNC Champions Club inside the stadium. On Tuesday, a funeral mass is scheduled to take place at Saint Paul Cathedral in Oakland.